The fall season is considered to be the best time of the year to renovate a lawn. Aeration, seeding and topdressing are the most beneficial services that can be done to a lawn during the fall months. Topdressing has been a common practice on golf courses and sports fields for many years for the purpose of creating a smooth and level surface along with the soil building organic benefits. Turf managers commonly used compost/sand mixes for this purpose and topdressing has only become popular on home lawns in recent years. Compost a popular type of topdressing is formed during the process of controlled decomposition of organic matter which has become stabilized. Compost has the ability to improve the physical characteristics of soil and is beneficial in growing healthy grass plants. Compost is not considered to be fertilizer but contains many plant nutrients. At TurfGator we also use a product called Biosol as a type of topdressing since it is 100% organic with significant soil improving qualities. Soil that is enriched with 3-5% of organic matter will result in healthier grass plants and inhibit plant pathogens suppressing types of turf diseases. Increased percentages of organic matter also allow more nutrients to become available for plant intake. Soil test results from hundreds of lawns in our local area have shown that most lawns only have approximately 2% of organic matter. While increasing the percentage of organic matter may take several years the positive impacts can be significant to the visual quality of a lawn with increased nutrient uptake from turf grasses. Improved soil structure from organic matter will improve the ability of the soil to store water and to absorb water resulting in less water runoff following rain storms. Soil high in organic matter also results in lower surface ground temperatures which reduces stress with turf grasses and prevents some weeds from germinating. 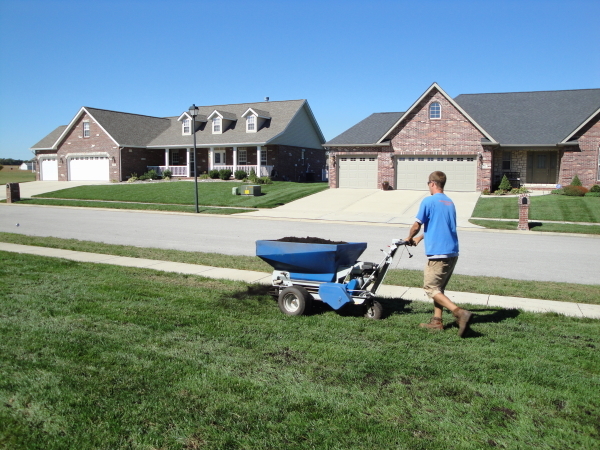 While topdressing can be done at anytime during the year, most homeowners prefer to apply it after aeration as the soil is exposed allowing the organic matter to fall into the holes created by an aerator. Although some impacts (e.g. a deeper green color) may be observed soon after application of compost, other results are more subtle and take more time to be completely observed. If you would like an estimate for topdressing, please call our office at (618) 539-9811 or complete our request estimate form and we will provide you with a quote.